People often ask me “when can you come play in my town? I’d love to see you live!” Here are the seeds the beginnings of the grass-roots network of touring musicians, hosts and music lovers that we call the house concert circuit. A House concert is a celebration of independent acoustic music and song in the comfort of your own home in the company of your finest friends, family and music hounds. Click HERE to read RECOMMENDATIONS of Karyn’s house concerts from hosts / audience members and watch VIDEOS of Karyn performing live at a couple of house concerts. In brief – you need some friends, a largish indoor space, lots of chairs, bean bags and cushions, some space for BYO snacks/drinks and the ‘Merch Booth’. If you have a decent sized living room that can snugly seat, beanbag, couch and laze 25 to 55 people then you have all you need to host a fantastic night of music. If that sounds like a lot of people, well – you’d be surprised how many folks can comfortably share space together when the room is set up theatre-style. This is flexible and up to the discretion and convenience of the host, but a typical house concert opens it’s ‘doors’ for friends and fans at say 7pm, when people arrive with their BYO, mingle, munch and drink with the artists and get comfy in the performance space. There are usually 2 sets of music, each running for about 35-45 minutes. During the intermission and after the show everyone gets to enjoy the musical company of friends and strangers as well as time with the host and artist (aka me). Bear in mind that these performances are ‘house concerts’ not ‘house parties’. This is an important distinction. 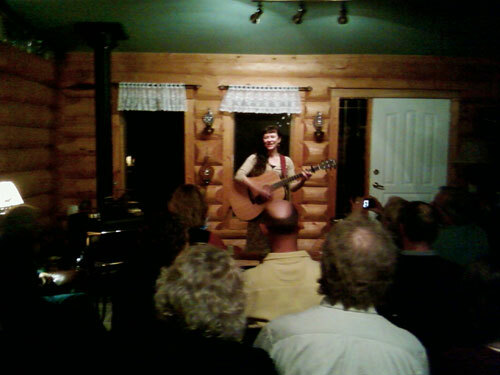 House concerts often turn into parties when the show is finished, but the actual concert is attended with the same intention that would be had when going to a theatre. Once again, these are actual concerts, not a side addition to a back yard BBQ or games night. Hosts need to organize another space or large kitchen where guests can put their BYO snacks/treats/drinks and chat with the musicians during the course of the evening. Also, and very importantly, hosts need to have another table or suitable space available where the artist can lay out their CD’s and any other merchandise for sale: The Merch Booth! Please let your guests know that I will be selling their CD’s at your show as many first timers often won’t know to bring a few extra bucks for this and be disappointed. This is fully negotiable between the host and the artist (me), and in keeping with the spirit of house concerts, takes the form of a simple verbal/email agreement. We can either agree upon a set fee for the act, or agree to ‘donations’ from guests. If we go the route of donations (most common), you can collect money when you take reservations or at the door, or simply set up a jar somewhere prominently where you can direct people to contribute. This works the same way as people bringing drinks or a plate of food to contribute to the evening, and they should be made aware of this as part of the invitation. In consideration of travel expenses and intimate size of the concert, if there is no set fee for the show usually I receive 100% of donations from the door. If there are exceptional expenses beyond normal costs of throwing a soiree, we can discuss reimbursement, which would need to be negotiated prior to the show. 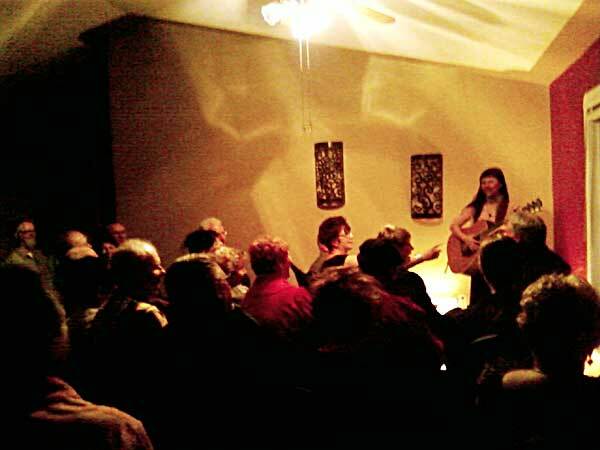 In general, house concerts work best when audience numbers are within the range of 25-50 people and each guest contributes in the order of $15-$25. More than likely, the show won’t need any amplification. This means that the room must be arranged so your guests can enjoy the concert space as you would a small theatrette with full attention and few distractions. There is the odd occasion where you may have super large room or we’re planning a garden show outdoors that we may need to rent a PA system or amplification. During the booking process, we will discuss whether you will supply it or I will. Kids are most welcome, but consider that they may need something to keep them occupied while you are focused on the music. Some hosts have a play area outside for the kids, and others even have room to set up space for the little sleepy ones. There are a few other things that will help make the show go smoothly. Depending on what time I arrive in your town, there is the matter of eating dinner before the show. If you’re amenable to feeding me, that would be wonderful. (Heads up though ~ I don’t eat olives or raisins! Yuck!) If cooking’s not your bag, directions to a tasty local restaurant would be great. And unless you happen to live down the street from me, I will more than likely need accommodations after the show! A simple guest room in your home or a room in a nearby half-way decent motel will suffice. Finally, before the show I also need a space aka a “green room” that is tucked away from the performance area where I can tune up my guitar and prepare my set list, etc. If I’m staying in your guest room, that will work perfectly. Otherwise you can set me up in any room tucked away with a door that I can close, so that I can prepare for the performance. Sounds like a lot of work… what’s in for me, the host? Click HERE to read RECOMMENDATIONS of my house concerts from hosts / audience members and watch VIDEOS of me performing live at a couple of house concerts. Big thanks to David Ross MacDonald and Coco Love Alcorn for letting me use this information pretty much verbatim from their websites to post this FAQ. Want to hear Karyn play live? Why not host a House Concert!